Finally. It took me almost 3 months to complete this sweater - my largest project to date. I am reasonably pleased, and I learned so much! This is a great knit. My only beef is that Veronik assumes a level of experience that I didn't have (well, it was rated piquant, after all) and I didn't know, for example, that I should keep the raglan decrease stitches in stockinette instead of trying to maintain the moss stitch on the wrong side. I admit to a few Harlot style conversations with Veronik - but really, these issues are so minor! The lace patterns fit together really well and after 2 sleeves and most of the back I think I had it memorized ;-) I am a bit sick in that I love the challange of trying to stay in the pattern, decrease or increase as indicated, but still wind up with right number of stitches in the end . The first sleeve, with raglan decreases on each side taught me a lot. I had to redo it after I did the second one (correctly) and realized the consequences of, "Hmm. I'm off by a stitch. Oh well. I'll just throw in an extra K2tog right here"
Cascade Superwash is really nice to work with. 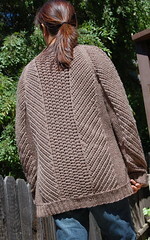 It is soft, forgiving and holds the stitch definition so well! I had the gorilla arm experience again. I was, I admit, a little freaked out after the first sweater bath. Everything got 2-4 inches longer! I was seeking out advice on Ravelry on the whole slice off the ends and knit up the cuffs when someone suggested tossing the thing in the dryer. Dudes, I washed it in the machine, but isn't the whole dryer concept a bit much for wool? Apparently not. Tossed, tumbled and the sweater went back to where my swatch said it would. I think, now that I've worn this a few times, that I am more of a fitted sweater kind of gal, but I really like this for what it is. Comfortable, casual and the perfect thing to wear on a day when, say, the carbs and sugar have taken over your life.